Often our most delicate and pretty objects tend to be some of our smallest objects. This is certainly the case with the reliquary pendant which was found a few years ago at Ampthill. The pendant, a golden coloured lozenge shape, is about 46mm high and 14mm wide. The pendant displayed opened, with St. Ann on the left. The stunning beauty of the pendant is only really revealed when it is opened up to show two miniature pictures inside made in gold and coloured enamels. One of these images is thought to show St. Ann teaching Mary to read. The other image is not so easily recognised but most likely depicts another saint. Though the images show a bit of damage the fine detail and skilled craftsmanship of the maker is still very obvious to see and the delicate images are made even more remarkable because they are so small. 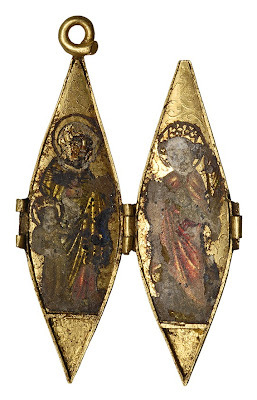 Similar reliquaries found on the continent have been attributed to specialised workshops located in France, especially in Limousin and Poitou, operating in the 1300-1400’s. The pendant itself, even though it is incredibly beautiful, can only tell a small part of the story. To try to understand more about it we need investigate the bigger picture and travel beyond Ampthill. The first thing to do is to find out more about St. Ann herself. Also why would such a fine piece of devotional jewellery have been made and who may have worn it? A small amount of research instantly explained the importance of St. Ann. We learn she is the wife of Joachim and one day whilst she prayed beneath a laurel tree an angel appeared to tell her that she was going to have a child. The child that Ann gave birth to was named Mary. In later life Mary was to become known as Mary the Blessed Virgin. ﻿The worship of St. Ann is generally thought to have begun in the east during the fifth century and slowly spread across to the west during the medieval period. A shrine at Douai in northern France became established during the 1300’s. Over time many shrines dedicated to St. Ann sprung up in France and her popularity spread to England: a shrine dedicated to her is found at Buxton. As her following grew St. Ann became established as the patroness of women in childbirth, housewives, cabinet-makers and miners. Looking at our pendant from Ampthill it is tempting to visualise that such a beautiful and precious object showing such a touching snapshot of parenthood, a mother teaching her daughter to read, may have been worn by a young woman who worshipped St. Ann and who was anxious to keep her own young daughter safe. 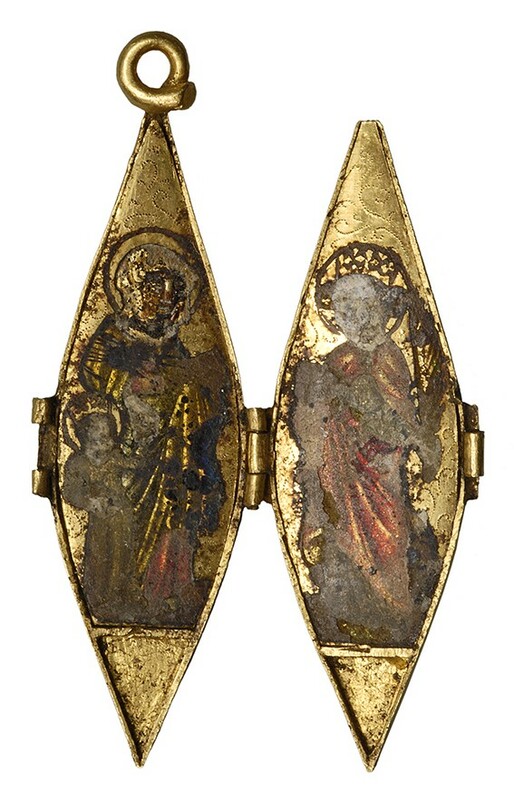 The stark truth is we will never be able to say for certain how the reliquary pendant came to Ampthill or to say how many owners it had and who they may have been. But what all objects like this show is that people in the past went through the same array of expectations, actions, emotions and all of the ups and downs of life as we do.